Heavy metal is often thought of as a dense, weighty mountain of music that presents itself as much as an aural challenge to be ascended—an intense rush of sheer volume, sonic overdrive, thunderous rhythms and often screaming vocals—as something to be enjoyed. But the metal mountain has become fractured along fault lines of numerous niches and subgenres over the years. Nate Carson, drummer for White Mountain, tells how the Portland, Ore., doom-metal band has managed to survive almost two decades as one of the standard-bearers of their singularly slow style of metal—lumbering yet incandescent, like a lava flow. In the '90s, he recalls, the sibling genres of doom metal and stoner rock, which also describes their sound, weren't as familiar terms as they are now. "No one knew what [doom metal] was," he notes. "And most people couldn't understand why we'd want to play so slow and bluesy—metal at that time was primarily thrash and black metal, and much more extreme. We helped people embrace and accept it as a valid form of music." Not that the music is topping the pop charts now. "The average person has no idea about us or [Profound Lore label-mates and Salt Lake City-based doom metal band] SubRosa." Although Carson and guitarist Rob Wrong, who together founded the band in 1997, cite as unlikely influences the Beatles and Pink Floyd, the most direct antecedent in classic rock to their style was Black Sabbath. 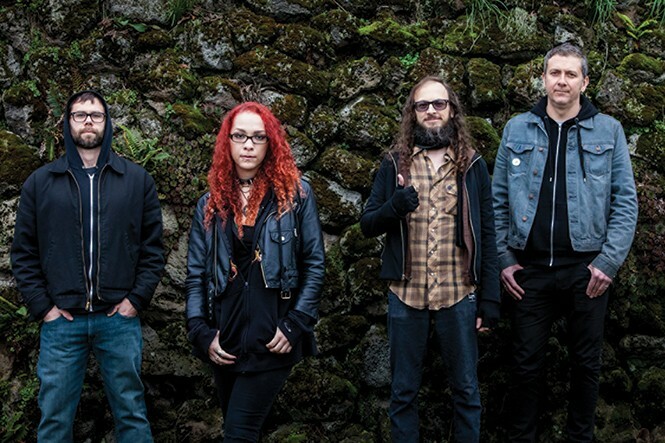 They have also been inspired by the huge success of fellow Oregonians YOB, who have been featured in The New York Times and whose last album, Clearing the Path to Ascend (Neurot) was Rolling Stone's heavy-metal album of the year in 2014. "It's wonderful to see our friends getting this kind of attention," Carson says, "though we feel like we had a head start on them in the early days." Witch Mountain looked set to go on hiatus with the departure of vocalist Uta Plotkin last year right after the release of their Mobile of Angels (Profound Lore) album. But then Kayla Dixon asked to audition, and was hired immediately. "There's a youthful enthusiasm," Carson says of the singer, who has a theatrical background. "But also, she's tremendously talented and disciplined and focused. She has a really soulful voice. Replacing Uta was really tough to have to do; we expected to have a year or two off trying to find someone who might have a fraction of her talent." Then, even more fortuitously, the band was invited on tour with Danzig, and one date includes Rob Zombie. "We're really flattered," Carson says. "It's a wonderful feeling. I'm a big fan of Danzig going way back—in fact, I saw White Zombie open for Danzig in 1992. So the fact that we're all sharing a stage now is really cool. I think the Danzig audience is very prepared to hear slow, bluesy metal, because that's kinda what he does." They join Danzig Oct. 3 in Tempe, Ariz., and the Rob Zombie show is Oct. 30 in Las Vegas. Carson admits that the fractionalization of metal music at first made for higher experimentation, but now that experimentalism seems to have reached its limits: "I think it's fair to say that it's harder to innovate, and then [there's] the question of which bands are even trying. Until the last couple of years, every year there was a new album that was the heaviest, or the fastest, or the loudest.The last few years, I have seen less innovation, and the best bands tend to be more traditional." Although Witch Mountain has what he calls a unique "weird factor," they are more traditional. They do their own booking and management, and he believes they've avoided being "screwed" by unfair record deals. Without major label support, they managed to get featured on the Adult Swim Metal Swim compilation (2010), which afforded them TV exposure on the network. There has to be some innovation, intermixed with periods of classicism, in order for heavy metal—or any genre of music, for that matter—not to atrophy, or become too much of a monolith. "I've been in numerous progressive bands over the years, and I think it's really important that people continue to try to innovate, make new sound and come up with new ideas, but the mission of Witch Mountain is just to make really great rock music," he states.